I love my Glocks simply because they work each and every time I pull the trigger. 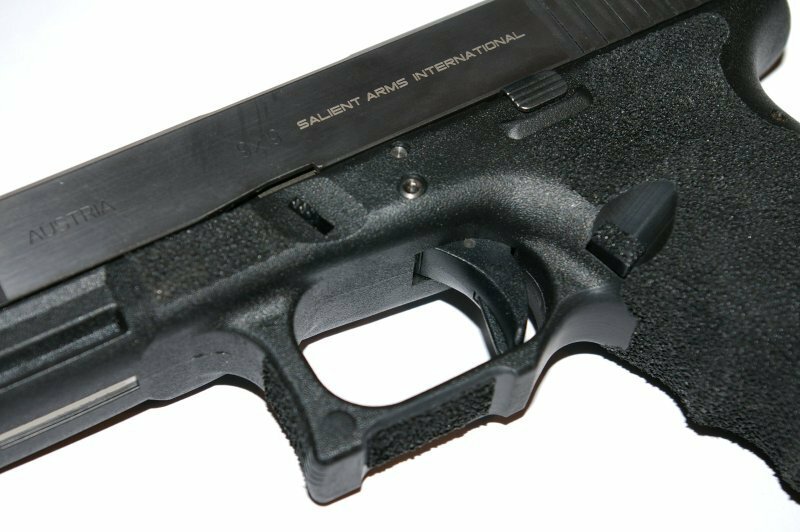 A primary selling point for me and most firearms experts is that the safeties are integrated into the trigger with no other switches to flip during times of stress. My Glocks have been carried daily for personal defense, trained with, and shot for target and fun at distances up to 300 yards (and yes we were able to hit a 12”-300 yard gong consistently after a few tries). Glocks are also plenty accurate to hunt small game with solid FMJs and I can attest a Glock 9mm is fabulous on rabbits. Of all that is good about Glocks, there is about 10% I wanted to change including grip, comfort, smoothness of operation, and the trigger to make it just that much better. 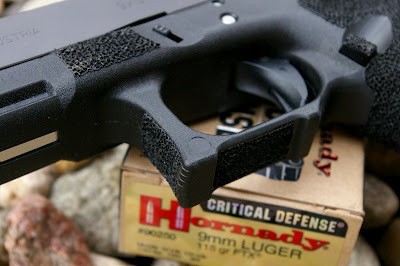 The one things that has always annoyed me with the Glock 17 is that the front of the lower receiver above the rail curves up which in my opinion just looks a bit ghetto for a class leading pistol and can inhibit smooth operation. 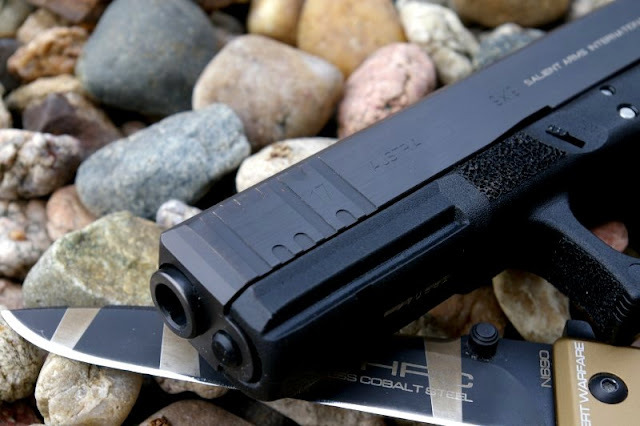 The Glock is exceptionally easy to work on and generally I do a lot of my own gunsmithing, however I have also witnessed first hand the reliability decreases some Glock owners have tinkering with drop in parts. I cannot count the number of times a Glock owner has started cussing after adding a new “non-stock drop in part”. In a defensive pistol these drop in parts can get you killed if not installed correctly. So for a little more money, I decided it was time to turn this defensive carry pistol project over to Salient to make it run better versus worse and know that any upgrades done would be done right. 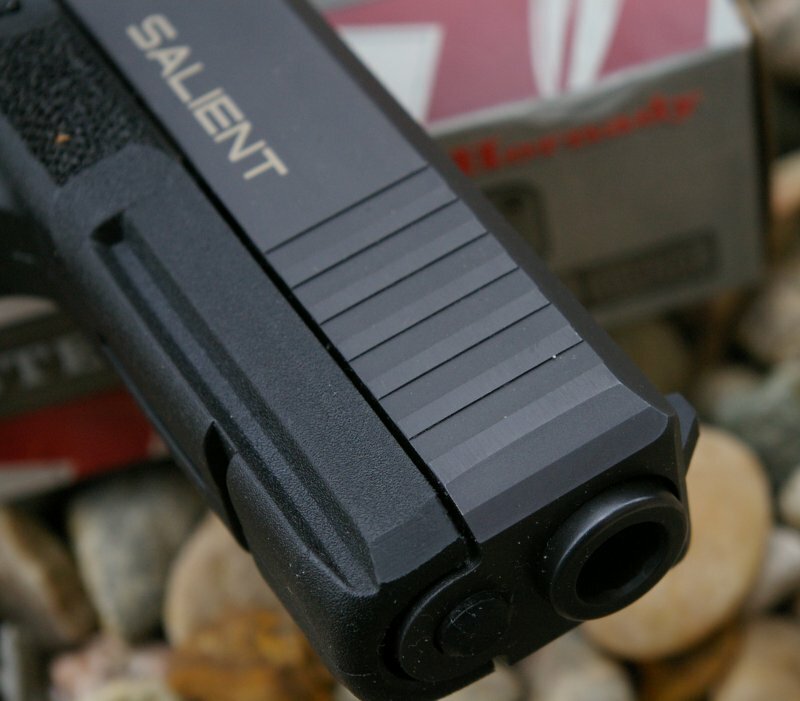 This "need" for an even better Glock led me to Salient Arms International - SAI. 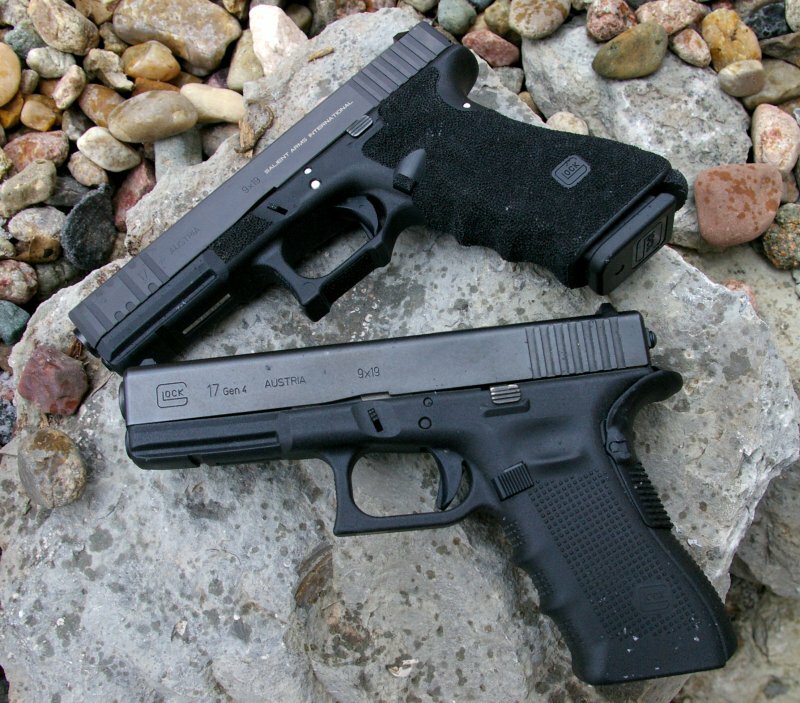 The normal armchair gunsmiths that troll forums certainly have heated debates over the validity of customizing a Glock or in general any plastic pistol, however the continuous competitive wins of Glock shooters who have tweaked, tuned, and modified Glocks would tell another story and those such as Taran Butler with Salient Arms tuned guns seem to have more than a few competition wins. From my perspective there is as much validity in customizing a Glock to your needs as customizing a 1911 as they both start off around $600-$800 in base configuration. For this build, I wanted to retain 100% of the stock parts expressly as a concealed carry gun. Though the pictures may indicate a competition build, the intent of this build was purely to perfect a stock Glock 17... basically I wanted my Glock to have a tuning package just like the 1911 owners do to improve upon an already great gun. No matter how good a gunsmith's reputation is, I have control issues which manifests itself when I turn over a gun to someone and say go to work on it. After handling a few of Salient International's Glock conversions and talking to a few owners, I packed up a Glock 17 and sent it in. In this case the Glock 17 Gen 3 I provided had a mismatched slide serial number due a slide replacement from some serious slide damage. Even though this is a non-event from an FFL perspective (serial numbers are always taken off the lower receiver), some folks freak out over this and the result is I got a smoking deal on this used G17 as the platform for the Salient Tier 3 Conversion package. 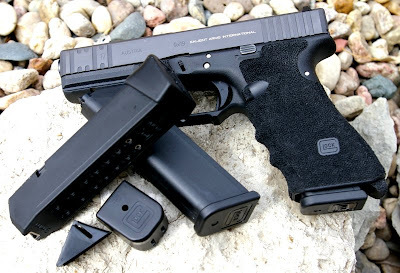 I know everyone wants a tricked out competition gun these days with 1lb trigger, however what I wanted was a Glock tuned for the highest possible reliability while maintaining a defensive stock weight trigger and stock barrel. In essence I wanted an even more dependable Glock I could run harder, faster, with more control and with a bit better trigger. The result of those needs and a discussion with the folks at Salient resulted in me choosing their entry level Tier 3 Conversion Package. The $1000 Tier 3 package delivered exactly what I wanted to slip into my beautiful Galco belt pancake holster for concealed carry and potential use in a few competitions. 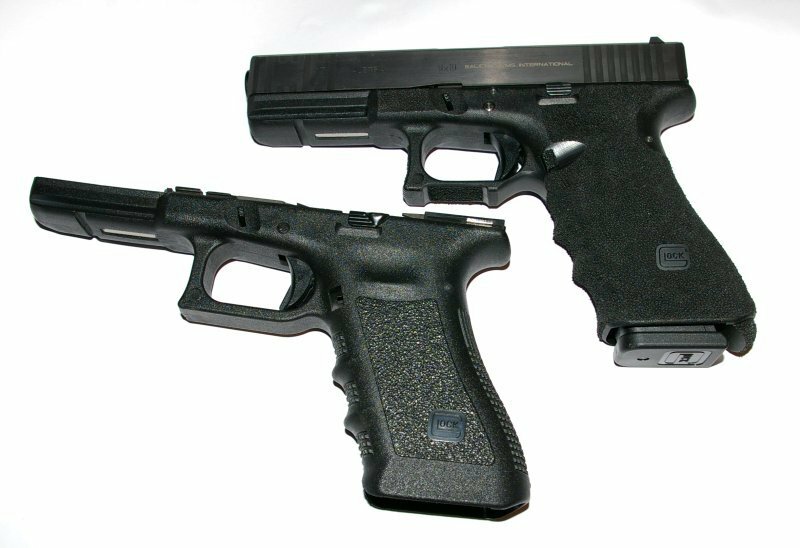 Comparing Glock Gen 3 G17 frames before and after SAI conversion. If I could sum up my beloved Glocks, I would say they are not pretty, but they are the most reliable semi-auto pistols I have ever shot. There are some shortcomings. The grip fit is not optimal for anyone, but works for most and the finish is highly durable, but not overall very attractive. The feel of the gun is a workable combat pistol, but it lacks a grip that securely locks into your hands when you start sweating buckets. Many have referred to the slide as a beautiful as an overweight 2x4. The Salient conversion transforms the look and feel starting with the grip. Grip - SAI actually has a set of artist who perform the grip stippling (texturing). 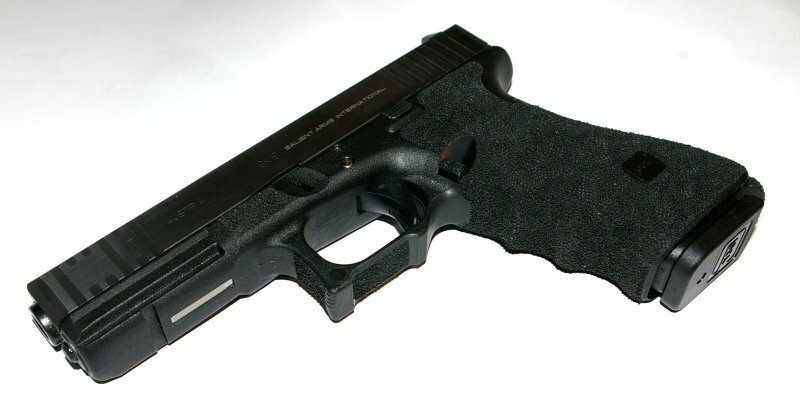 I have seen a number of professional stippling jobs that looked horrid, but the SAI work is so precise that it looks like a CNC machine did the texturing throughout the grip, trigger guard area, Glockmeister grip plug, and rear firing pin cover. 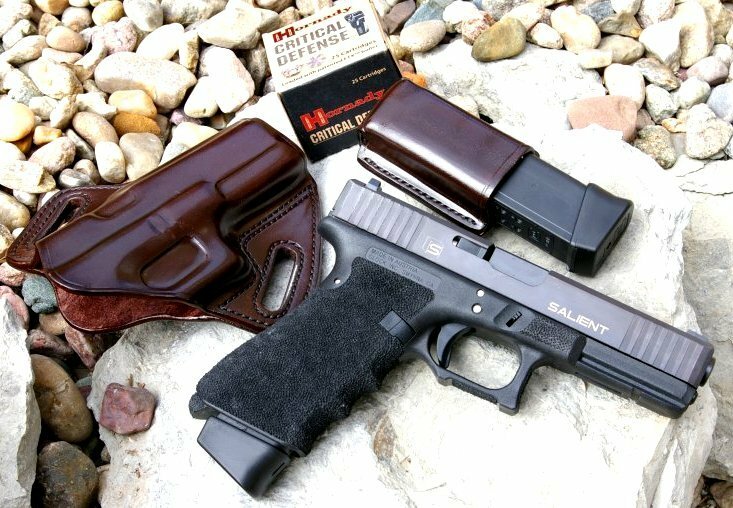 Situated in a Crossbreed Supertuck or Galco pancake holster with a undershirt, the Salient stippling does not chafe or wear on the skin. If the grip is just a tad too aggressive for you, a pass or two with a little very fine grit sandpaper will take the edges off. 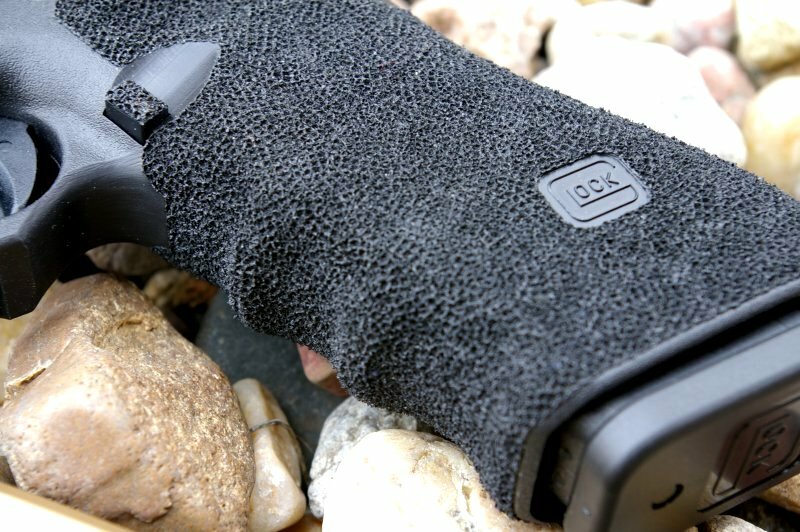 SAI has a 60% stippling option which leave the weak side of the grip smooth for better comfort next to bare skin. If I were to do another SAI conversion, I would do the full stippling again and just plan on hitting the rough chafing areas with a little sandpaper. Generally as a rule you should have a grip on a defensive firearm as aggressive as you can stand because after all comfort is the last thing on your mind when being attacked. In that situation, firearm retention is critical when slippery blood sweat and tears are involved. SAI ‘s grip takes a step further beyond a finely stippled grip texture by recontouring the backstrap and opening up the space between the front strap finger grooves which is infinitely more comfortable. Salient also did a ton of R&D to find the optimal trigger-guard middle finger undercut and just the right amount of relief under the trigger guard without reducing . 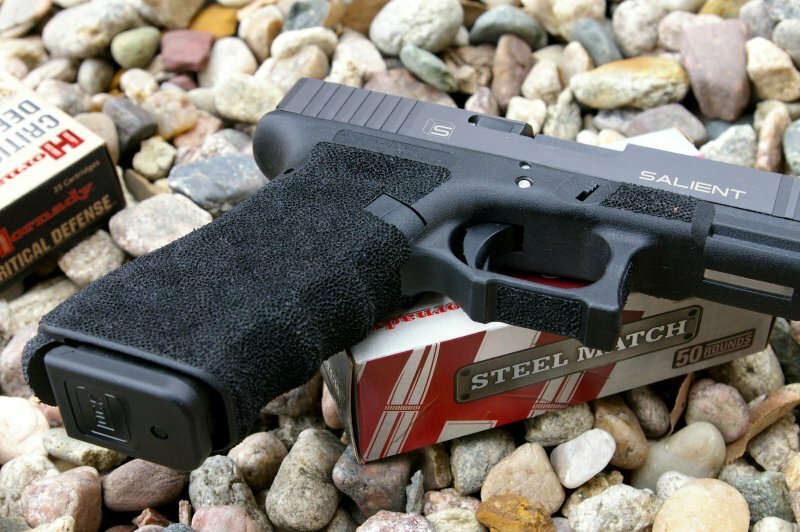 All these little tweaks result in a final Glock 17 hand locking grip which is far from the original Gen 3 fit and feel. Honestly it is the most perfect feeling Glock grip I have yet to handle. Everyone who has handled it gives it a "ohh, ahh, they is really nice" comment. SAI CNC machines a “comet cut” magazine release recess which allows perfect access to the stock magazine release. Functionally this is an outstanding feature and is also a better situation on a defensive pistol than upgrading to an extended magazine release which are prone to being accidentally hit. 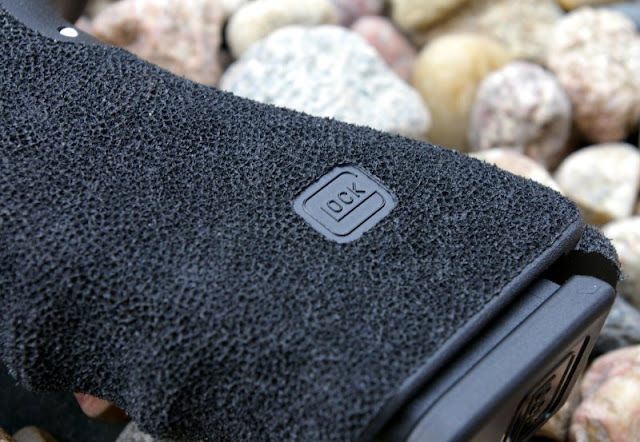 The other grip enhancement is the forward stippling just behind the accessory rail and is purely aesthetic. 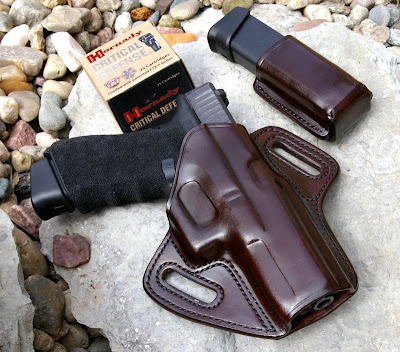 I could do without this stippling as all it does it eat the inside of leather holsters and adds too much tension to the holster draw stroke and it too far forward to actually provide any grip on any finger. I sanded off this stippling. Slide - The most visually noticeable magic Salient performs is on the stock slide. The goal of the CNC re-milling of the stock slide is to reduce weight and reduce recoil. It is generally known that the stock Glock slides are heavier than needed and SAI has gone through the R&D to understand how far you can lighten the slide without changing the stock springs. The Salient slide treatment dropped just over a full ounce from the slide which makes my SAI Glock 17 the same weight as my Glock 19 - 21.5 ounces. From my testing, the cycling was perfect, but just a bit faster but with noticeably less recoil. 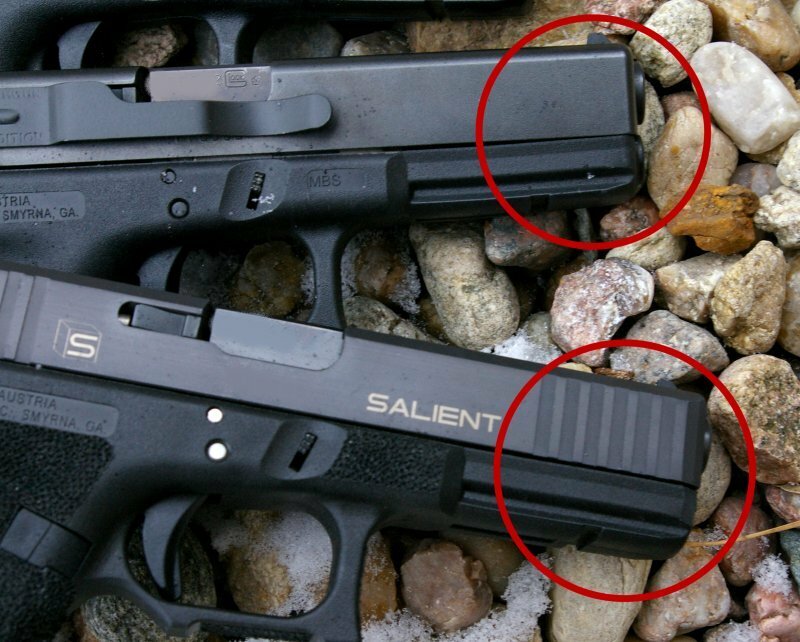 What I noticed was that the SAI G17 shot a little flatter in a direct side by side comparison to my other Gen 3 Glock 17. The top of the slide is left untouched in the process, but the rounded top edges are squared to 45 degree angles, front serrations are milled in and the rear serrations are sharpened up during the truing of the left and right sides of the slide. The one nuance I did not like was that the side and top edge milling created a sharp edge on the front of the slide’s ejection port area, however SAI has noted the issue and is cleaning that edge up going forward. For me I touched this area with a Dremel polishing bit to take the edge off. Salient Arms International created its own S Bond coating which is a blackened version of the premium gold coating on milling bits. This coating is virtually wear free and increases lubricity and overall durability. SAI noted that technically the gold finish is more durable, however most people do not want a gun that flashy. Although Salient offers upgraded sights as an option, I stuck with the stock sights as I had a set of AmeriGlo CAP sights ready to install after the conversion was complete. Trigger & Connector Tuning - Right after the first round leaves the barrel you will be shocked at how crisp the trigger rework is. There is literally no trigger reset or take up on the SAI tuned trigger. 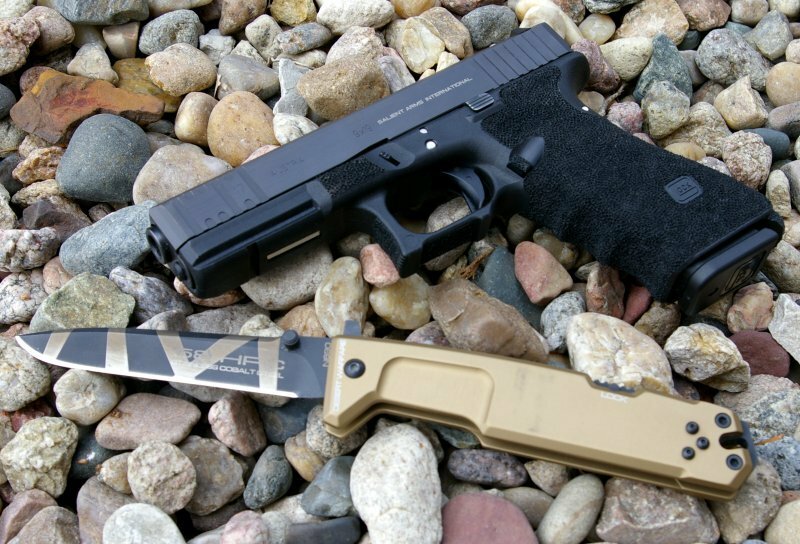 To further improve the feel of the trigger, SAI performs a polishing of the stock Glock parts. Salient does not swap out the trigger but tunes the trigger with a take up pin instead to reduce take up and overtravel. On a defensive focused pistol, I would not want an aftermarket trigger any lighter. With no take up and a super crisp break, my mag speed emptying abilities were greatly improved. Shooting both my stock and the SAI G17 side-by-side, the final trigger pull weight between the two is about the same, however the SAI with the stock polished parts was a bit lighter and felt worlds crisper without any take up. The only parts upgrade swap on this conversion was from the stock action/receiver pins to three stainless oversized pins. This one upgrade seems to tighten things up a bit, especially on a gun that has been ridden hard and disassembled a few times. have the persistent warped frame syndrome solved by SAI. 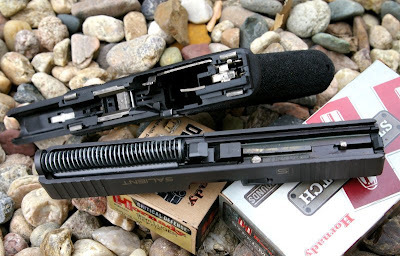 Frame Straightening - Pick up any generation of a Glock 17 and you will see a front rail that oddly and incorrectly bends up to meet the slide. Since its inception, I have always been stunned that Glock has not fixed this issue. As you can see in these pictures, my Gen 3 and Gen 4 both had this issue. The reality is that this frame alignment does not just stop there, it extends all the way down the frame. Today SAI has a special custom jig which heats the frame just enough to straighten the frame. The result of this frame tweak is that you would swear the Salient Tier 3 conversion includes polishing the slide and frame rail guides. Buffer/Recoil Spring - The stock recoil rod works like a charm, but is far from smooth feeling. 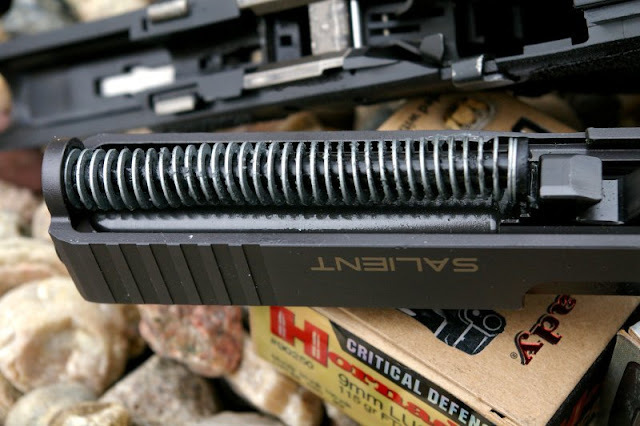 To smooth things up, the captured recoil spring is often a replaced item, however without proper tuning, it can also be the culprit of malfunctions. A a Glock shooter the result of this warped frame and recoil rod is that charging your Glock 17 sounds like grandma's screechy screen door spring. Salient discovered that if the frame is straightened and the stock recoil rod is simply polished that the slide suddenly would cycled like a polished action. I am still amazed how smooth the slide action is now. 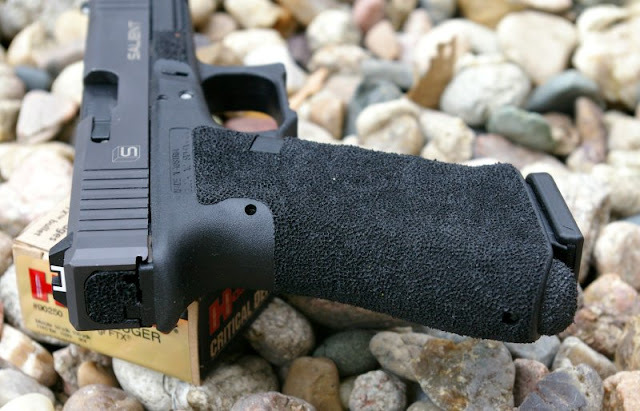 I find it odd noting that the Salient Tier 3 conversion runs better than a stock Glock, because after all in stock form, Glocks run perfectly. In the the case of the SAI conversion, my Glock 17 is now functionally smoother, faster, and flatter shooting due to the slide lightening and frame straightening. The upgraded grip finish locked the Glock into my hand and allowed a much more confident grip versus the rather slick stock finish. The slide resurface made the serrations sharper which increased reliability of the “draw, charge, & fire” stroke. Accuracy also improved by about 10%-15% from the trigger tuning and internal polishing and reloads were a bit faster as well due to the Comet cut access to the magazine release. All these things add up to a gun I feel much more confident to safely push harder and faster; the result is tighter groups, more hits on target and less time between draw and fire. 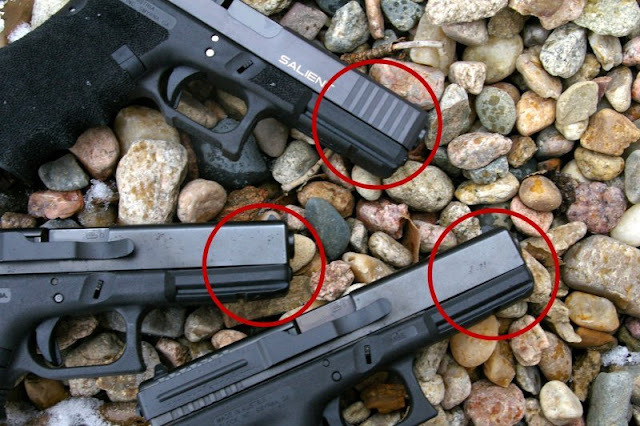 Comparing Glock Gen 4 G17 frames to SAI Gen 3 G17 conversion. There is always a premium to have a professional gunsmith work over a gun. In this case a couple extra hundred dollars assures you have a gun you can stake your life on, however $1099 worth of gunsmithing work on a $700 Glock may be a bit much for some to handle on a pistol that already works great. In most cases for some reason these same naysayers will be the first in line to hand over a perfectly good $700 1911 for another $1000+ worth of tuneup and reliability work. The reality is both are just guns and if you can make them better, why not? Adding up the work separately, for a $200 grip job, $250 for a upgraded trigger, and another $100 for an action polish puts you into the $550 range and still does not smooth out the slide, correct the common frame warp issue, or lighten the slide which I would estimate at around $300-$400. It is always good to be able hold one gunsmith’s feet to the fire on the job, or you may end up with a gun that does not shoot well or worse yet is potentially unsafe or unreliable. To me the extra $200 to know it will all work right was money well spent on a pistol I stake my life on. To date I have put more than 500 rounds of steel case and defensive Hornady ammo as well as a sizable number of my own reloads and I have yet to have a malfunction. Where I did find an increase in reliability was with my occasionally lightly loaded handload; believe me the ounce lighter slide makes a difference. The G17 feed this same ammo before the conversion without incident, so it was my expectation that things would only get better with the slide lightening to increase cycling of the occasional light handload. Did the Salient Arms International -SAI Tier 3 conversion “Transform! !” my Glock drastically? No and I hoped it would not as I really like about 90% of my Glock. It is the other 10% of annoyances which I normally live with which most were corrected on the Salient Conversion. Despite the custom appearances, it is important to note that Salient did not swap out any parts with aftermarket versions except the three stainless oversized receiver pins on this Tier 3 conversion. The Tier 2 and Tier 1 conversion upgrade a number of parts, but on the Tier 3 each and every part including the trigger shoe were stock tuned and tweaked parts all in an effort to improve reliability, handling and accuracy on a gun intended for personal defense. 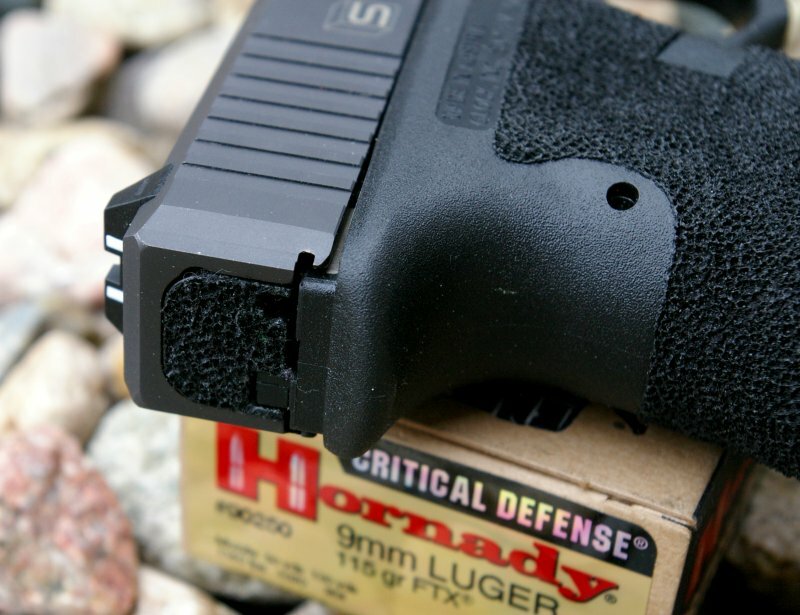 This conversion is first and foremost a carry gun conversion. The advantage is that this SAI Tier 3 converted Glock is not a hypersensitive competition conversion which could become a liability in a defensive situation, but tuned enough to provide a significant advantage on the weekend 3-gun course by just dropping in a KKM aftermarket match grade barrel with a compensator. As is I am extremely pleased with the conversion carried in the Galco pancake holster and my Crossbreed Supertuck holsters, however the SAI stippling can be just a bit rough on the inside next to bare skin. I very lightly hit that side with sandpaper and it took the hot spots off for me. 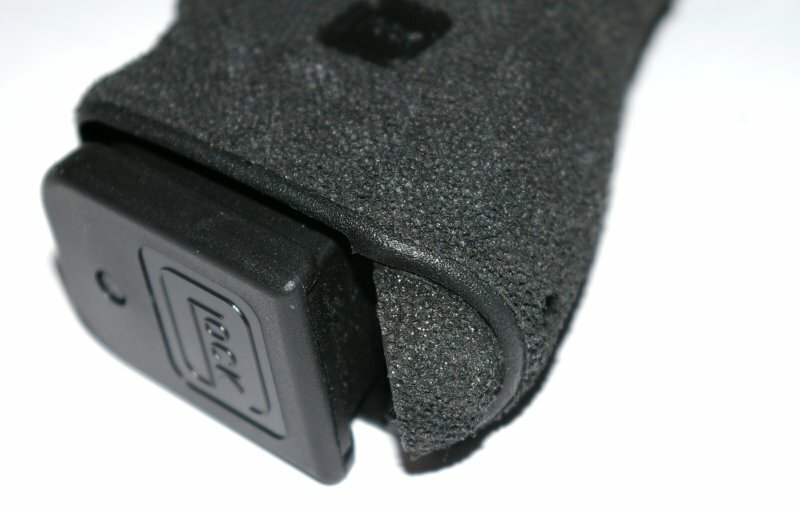 The slide width is modified, so you may need to tighten up the retention on your polymer holsters such as my Blackhawk Serpa. A few other extras I added to the build were a couple Glock OEM +2 round magazine extensions to provide a 19+1 carry and competition option. I did pick up a gorgeous Galco pancake holster and Ameriglo Tritium CAP sights which I will review later. 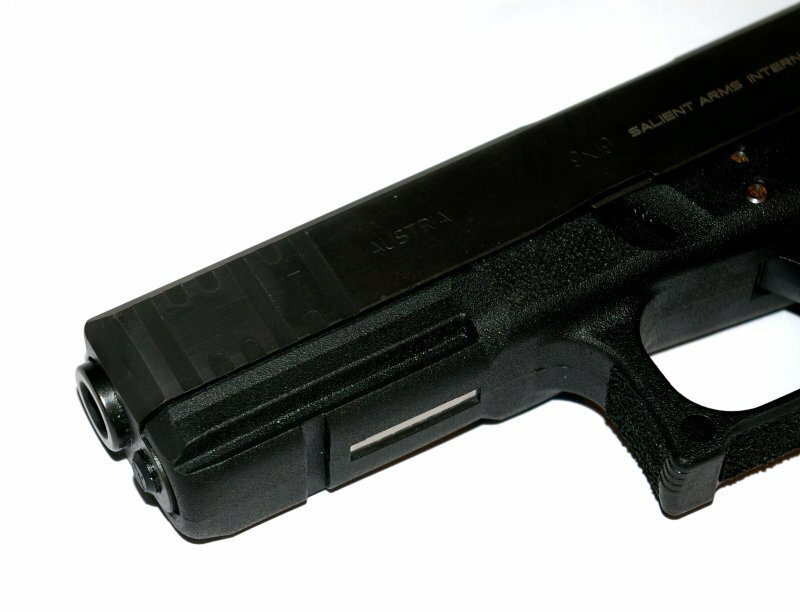 Some will scoff at upgrading a plastic gun however from my perspective this is the perfect Glock 17 carry gun and has proved to me the cost of the conversion is worth every penny and delivered the better Glock 17 I was looking for. What's the current round count on the pistol after the conversation? Any issues what so ever? I'm always anxious to do a bunch of mods to a gun that I might have to defend my family with. This has been the best modification I have ever made to a Glock. Been rock solid. Its the Glock on my nightstand if that tells you anything about how its reliability. Nice review. Did they change anything on the trigger (SAI Trigger Conversion)?? I want to get more out of my G17, but my Department will not allow custom internal work done to any duty weapon. SAI is all about options. If you do not want any trigger work done, then they will leave that alone. Later on I added a Salient Tier I trigger. Great review. I'm more interested in that holster. What kind of Galco holster is that? Is there some sort of lining to it? Which Galco holster is that? Love the looks. What kind of lining does it have? I must say, I've always been more of a SIG guy (just personal preference... I've spent plenty of time with both), but this review has piqued my interest. I think this will be my next investment. Again, bravo on the review! Since this article is a few years old I'm guessing you have since learned what the stippling aft of the accessory rail was for. If not, it's for additional traction when using the off-hand thumb to apply downward and inward pressure to mitigate recoil. This technique is advocated by several competitors and trainers, to include Frank Proctor and Rob Vogel. The technique works without stippling as well, but of course stippling makes it work a little better.